The Hackett Group's 2015 e-invoicing poll reveals the ups and downs of e-invoicing adoption. Benefits include a 42% reduction in the number of paper invoices and a 31% decrease in costs. 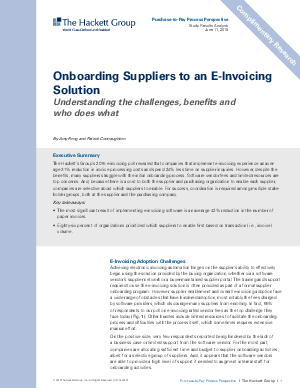 But many struggle with the supplier onboarding process. This paper explores the challenges and provides recommendations for improving the process.